A 33-year-old Corpus Christi man died earlier this month from the H1N1 virus, Texas health officials said Friday. The latest victim is the third fatality in Texas and apparently the fifth in the country. Corpus Christi-Nueces County Health District's Dr. William Burgin Jr. said Friday that the man died May 5 or May 6 after becoming sick a few days earlier. He said the man had preexisting medical conditions, including heart problems, that made it more difficult for him to survive any viral illness. Burgin did not identify the man but said he was a single parent of three children. He says one of the children contracted swine flu but was treated and is recovering. Burgin says county health officials received confirmation Friday morning that the man had died of swine flu. On Thursday, an Arizona woman suffering from a lung condition apparently became the fourth person with swine flu in the nation to die, authorities said. The Maricopa County Health Department reported that the woman in her late 40s died last week of what appears to be complications of the new strain of influenza. Meanwhile, health investigators are trying to figure out why swine flu has spread erratically - moving quickly through a few schools but slowly elsewhere - after an outbreak closed three more New York schools on Thursday. On Friday, a city official said that three additional schools would be closed in Queens and Brooklyn. The official spoke on condition of anonymity because the shut-down has not been announced. The decision on Thursday to shutter the schools follows an outbreak that left an assistant principal in critical condition and sent hundreds of kids home with flu symptoms, in a flare-up of the virus that sent shock waves through the world last month. Schools are a good incubator for illness in general because space is tight and youngsters often don't practice the best hygiene, said Dr. Isaac Weisfuse, a deputy commissioner of the health department. Across the country, most of the people getting the illness have been young. Some experts have speculated that older people might have some immunity to the virus because of genetic similarities to more common types of flu. "We're trying to answer some of those questions," Weisfuse said. Mayor Michael Bloomberg said four students and the assistant principal have documented cases of swine flu at a Queens middle school. More than 50 students have gone home sick with flu-like symptoms, he said. At another middle school in Queens, 241 students were absent Thursday. Dozens more were sick at an elementary school. The Health Department said the assistant principal from the Susan B. Anthony middle school is on a ventilator, marking the most severe illness in the city from swine flu to date. The students who have fallen ill in this latest surge of illness appear to be experiencing mild symptoms, similar to routine flu. The assistant principal, identified by colleagues as Mitch Weiner, may have had pre-existing health problems, the mayor said. In many other swine flu cases that turned critical, patients had pre-existing conditions. Adam Wiener, the patient's son, has disputed the reports that his father has been suffering from pre-existing medical conditions. He says the only condition his father had before was gout. He said his father is now suffering from kidney failure and a lung infection after being hospitalized with swine flu since early Wednesday. The 23-year-old Adam Wiener has been keeping a vigil at the hospital with his mother and younger twin brothers. Eighteen-year-old son Jordan said his dad was awake briefly and asked him about an earlier baseball injury. Bloomberg said that three schools - with more than 4,000 students altogether - would be closed for at least a week because "there are an unusually high level of flu-like illnesses at those schools." "There are documented cases of H1N1 flu at one of them," the mayor said, using the formal name for swine flu. New York City's first known cases of swine flu appeared in late April, when hundreds of teenagers at a Roman Catholic high school in Queens began falling ill following the return of several students from vacations in Mexico, where the outbreak began. At first, the virus appeared to be moving at breakneck speed. An estimated 1,000 students, their relatives and staff at the St. Francis Preparatory School fell ill in a matter of days. A limited number of kids had confirmed cases of swine flu because the Health Department tested only a small amount of students. City health officials became aware of the outbreak on April 24. The school closed and health officials began bracing for more illnesses throughout the city. But the outbreak then seemed to subside. Additional sporadic cases continued to be diagnosed, but the symptoms were nearly all mild. The sick children recovered in short order. St. Francis reopened after being closed for a week. The middle school with the confirmed cases is two miles from St. Francis. People at the school said students started going home sick on Tuesday and Wednesday, alarming parents. "I'm worried," said Dino Dilchande, whose sixth-grade son goes to the school. "The city should have taken more precautions. We should have been notified earlier." At the Susan B. Anthony, administrators posted a sign on the door from the Health Department informing students and teachers that the school would be closed for a week. The school is in the Hollis section of Queens, a neighborhood known for producing several rappers including the group Run-DMC. A knock on the door of an address for a Mitch Weiner in the neighborhood of the school went unanswered. At the start of the flu outbreak in the United States, government health officials recommended that schools shut down for two weeks if there were students with swine flu. But when the virus turned out to be milder than initially feared, the Centers for Disease Control and Prevention dropped that advice but urged parents to keep children with flu symptoms home for a week. Vaccine experts brought together by the World Health Organization Thursday have not yet decided whether to issue the go-ahead for wide-scale production of an H1N1 vaccine. Earlier in the week, a WHO medical officer said that 10 percent of people infected with the strain had to be hospitalized, which is far more than seen in the seasonal flu, reports CBS News correspondent Bianca Solorzano. 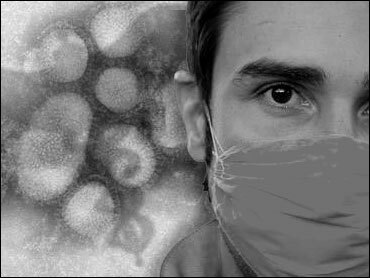 So far, the virus has not proved to be more infectious or deadly than the seasonal flu. CDC officials said schools may decide to close if there is a cluster that's affecting attendance and staffing.